A Tuscan vineyard is the perfect wedding venue for a romantic and unique Italian vineyard wedding. 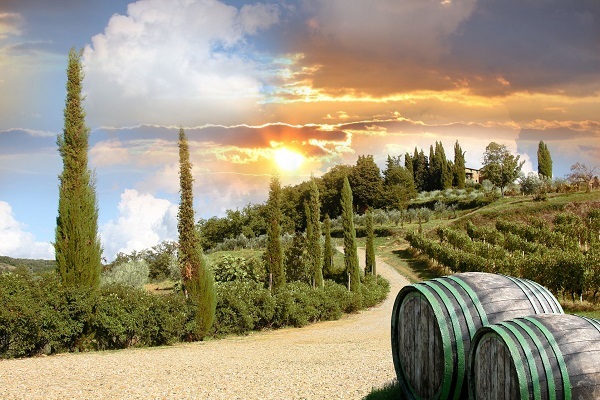 Tuscany and Tuscan wineries provide a picturesque setting for an unforgettable vineyard wedding in Italy: brilliant blue sky, vineyard covered rolling hills, isolated farmhouses and green cypress alleys that lead to wrought-iron gates. A wedding venue in a vineyard has a very natural beauty, rustic chic and style. A Tuscany winery can not only host amazing wedding receptions. It can be the perfect starting point for a relaxed and joyful destination wedding weekend in Italy full of amazing activities: From a rustic welcome dinner, an outdoor ceremony in a vineyard and a chic wedding reception and wedding party to wine tasting sessions, cooking classes or grape picking during the wine harvest with all guests. The birthplace of the famous Nobile di Montepulciano wine is around Pienza and the Montepulciano area in the south of Tuscany. Wineries in this area can host small wedding parties and weddings with many guest. Affiliated charming guest houses accomplish the warm welcome of the Montepulciano area. The Chianti area – between Florence and Siena – features numerous romantic and ancient castles converted into wineries or wine estates that can be a splendid medieval frame for a romantic vineyard wedding in Tuscany. Romantic small wineries can host destination weddings in the Siena and Montalcino area where the famous Brunello di Montalcino is beeing produced. In the Maremma region – close to the Mediterrean sea – couples can choose to have their Italian vineyard wedding in the birthsplace of the famous Supertuscan wines. Wineries around Bolgheri and Castagnetto Carducci will be the perfect host for a vineyard wedding in the Maremma region. You are looking for the perfect wedding venue in Tuscany for a romantic vineyard wedding? Don’t look further. Our portolio features the most beautiful vineyard wedding venues throughout Tuscany.